Online applications are invited for Pre-Metric Scholarship for ST students for the year 2018-19. 1) The student applying for a scholarship should have a mandatory bank account in his name. 2) Only students who are studying in the 1st year of this year can apply online. 3) Students studying in the 2nd grade from the 8th class who have not submitted an online application in the past year can download and fill the manual application with the necessary documents for school headmasters. 4) Students who are studying in Class VIII, who have applied online in last years, have to provide 14 digit registration numbers provided by the Social Welfare Department to their school headmasters. Just follow the below steps to apply for the Pre-Metric Scholarship 2018-19. Step 1 : Go to the official website of Karnataka Directorate of Tribal Welfare Department provided above. 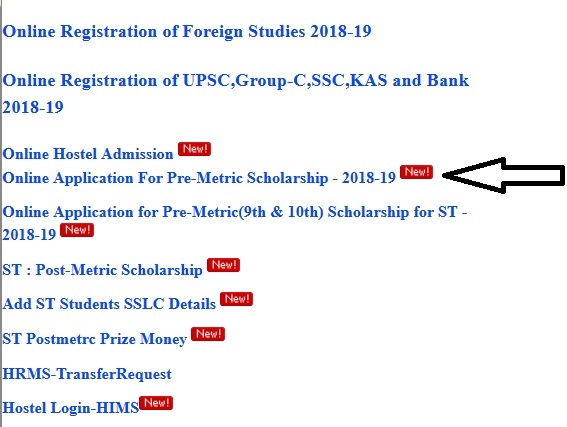 Step 2 : Then click ‘Online Application For Pre-Metric Scholarship – 2018-19 link in the home page. Step 3 : It will redirect to the Karnataka State Scholarship Portal. Next, Click on the “Create Account” link in the menu. Step 4 : If you are Studying between classes 1 to 10, then select Prematric else select Postmatric. Step 6 : Fill the remaining details to get your user id and password. After successful registration you will receive a confirmation message to your registered email id or mobile number. 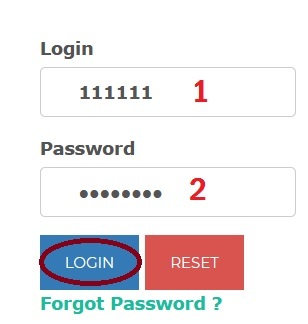 Step 7 : Enter your User Id and Password for Login. Step 8 : Select the scholarship scheme and fill the further details to complete the scholarship application form. Please update the School Running Status in TSWO by selecting menu – Administration -> School Running Status. Contacting the concerned Taluk Social Welfare Officer if their school details are not available online. I am reading 1st year B.Sc Nursing. When will you start the scholarship application for SC/ST students? I don’t know, how to cancel the submitted application because details are not correct. Kindly assist me to apply for Premetric scholarship. Please inform, when will SC scholarship start. Last year, I applied for SC scholarship but still I have not get it. I am belonging to ST. How can I apply for this scholarship?